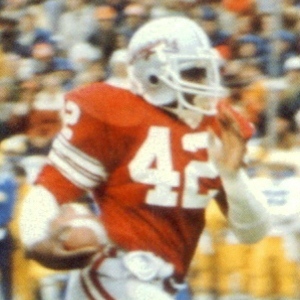 Walden’s 3-8 record in 1979 was boosted to 4-7 when Arizona had to forfeit its victory over the Cougars. Still, the disappointing season could be laid at the feet of the defense as the play of QB Steve Grant, FB Tali Ena who was drafted by the Seahawks, and the offensive line led by All American OT Allan Kennedy gave them enough firepower to win a few more games. Grant like many WSU gridders went north to the CFL for the ’80 season and then played with Oakland of the USFL for two seasons. Punter Tim Davey excelled as an All Conference choice, but giving up an average of thirty-three points per game was a recipe for defeat. Fans were delighted that the team’s helmet was upgraded with the return of the one-inch white center stripe, still flanked by one-half-inch crimson stripes, and a new white face mask. What had become the identifying “Cougars” in script style, remained, standing out nicely in crimson outlined in black. 1980’s 4-7 record was accompanied by an offensive splash that produced 394 yards per game, second best in the conference. The defensive yield was 381 but showed improvement from 1979’s group. LB Scott Pelleur who played for the Saints from ’81 through ‘85 and S Paul Sorenson stood out though the leading tackler was inside LB Lee Blakeney. Samoa handled the QB duties and Tim Harris rushed for 801 yards behind the solid offensive front led by All American tackle Kennedy who spent a few seasons with the Forty-Niners and OG Greg Sykes. Mike Washington, the Cougars second leading rusher and excellent return man did the same for Saskatchewan from ’82 through ’84. Walden’s policy of building through redshirts and experience was paying off. His balanced mix of run and pass made the offense solid and WSU was beginning to play tough. 1981’s 8-2-1 mark kept the squad in the race for the Rose Bowl until the final day’s 23-10 loss to Washington. Walden alternated running QB Ricky Turner and passing QB Clete Casper and the Cougars went without a loss in their first seven games. The Holiday Bowl would be the program’s first post-season appearance since losing to Alabama in the 1931 Rose Bowl and even the loss to BYU in a wild affair left fans thrilled. There were a lot of stars. RB Tim Harris’ 931 yards gave him the school career rushing record with one more season of eligibility. All American Pat Beach completed three starting seasons at TE and then played another nine years with the Colts and one each with the Eagles and Cardinals. Safety Sorenson again was All Conference and was named to some All American teams, playing behind active NG’s Matt Elisara and Mike Walker who played DT at Hamilton from ’82 through 1989. Walden was recognized as the PAC 10 Coach Of The Year. Though 1982’s fall to 3-7-1 after the euphoria of a bowl appearance was a tough blow for some, defeating Washington 24-20 and knocking them out of the Rose Bowl gave reason enough to celebrate. Injuries were a significant factor. The QB position again was shared by Turner and Casper. Tim Harris departed for a year with the Steelers as the program’s all time career rushing leader with 2830 yards. The defensive line was represented well by tackles Keith Millard, a former TE, and Eric Williams and NG’s Pat Lynch and Milford Hodge. The linebackers too were active and generally good. Junior Tupoula and Lee Blakeney were as good as Walden has had. The highlight of 1983 was once again spoiling their bitter rival’s season with a 17-6 win, and again preventing Washington from securing a Rose Bowl berth. The 7-4 mark was the second winning season in Walden’s reign. The defense came alive at the end of the season, limiting the last four opponents to single digit scores. Linemen Hodge, Lynch, Millard, and Williams were outstanding. Millard was the top defensive lineman in the conference, played in the USFL though he was the Vikings number one pick, and then joined the Vikings in ’85, becoming one of their best players of the era. A two time All Pro Bowl performer, he was also the 1989 NFL Defensive Player Of The Year on the strength of his record setting eighteen sacks. Millard later coached with the Broncos and Raiders. Williams enjoyed a ten year pro stint with the Lions and Redskins. Winning the final five games of the season came in part from Mark Rypien’s performance at QB where he took over for Ricky Turner who had a brief appearance with the Colts before heading to Canada for two seasons. An injury to Rueben Mayes opened the door for Kerry Porter who proved worthy at RB with over 1000 rush yards. 1984 presented a second consecutive winning season, a 6-5 affair that saw amazing performances by RB Rueben Mayes who got a chance when starter Kerry Porter went down with injury. The 5’11”, 200 pound All American from north of the border set a new NCAA record when he rushed for 357 yards against Oregon, following up his Stanford performance of 216 yards the week previous. In all, Mayes had seven games where he rushed for more than 100 yards and totaled 1637 for the season. QB Rypien threw for 1927 yards making WSU one of the best offenses in the country. Erik Howard anchored the defense and put in fine play with the Giants from ’86 through 1994 before moving cross town to the Jets for another two seasons. 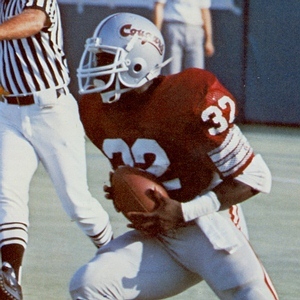 Called the finest player in the first century of Washington State football, Rueben Mayes played his high school ball and excelled in track in North Battleford, Saskatchewan and came to WSU upon the recommendation of former Cougar great Hugh Campbell. The College Football Hall Of Fame running back was a First Team Consensus All American in 1984 on the strength of seven 100-plus yard outings and a record setting day against Oregon that saw him tally 357 rush yards. When through, the 200 pound dynamo had set fifteen Cougars records, including 1632 single season yards, and a career rush mark of 3519. He ran for twenty-three TD’s and twice was PAC 10 Player Of The Year. In his NFL career, he was the 1986 NFL Offensive Rookie Of The Year and no doubt would have been overall Rookie Of The Year but his New Orleans Saints management forgot to nominate him for that honor! In his six year pro career with New Orleans and Seattle, he was in two Pro Bowls yet the WSU community is just as proud of his off the field achievements. Mayes served Washington State in its administration before becoming a Regional Director Of Development for a Eugene, Oregon hospital. Mayes remains one of the most revered players in the program’s history. Jim Walden was true to his word and only after his youngest son graduated from Pullman High School did he leave after nine productive seasons. Like Jim Sweeney before him, he was “about” much more than wins and losses, building a strong program and bringing in many talented players who went on to NFL careers. Popular with his players and those involved with the program, he moved on to the head coaching position at Iowa State in 1987, having finished 1985 and ’86 with 4-7 and 3-7-1 seasons. After eight years at Iowa State, Walden became a radio broadcaster for the Arena Football League Iowa Barnstormers and later, for Washington State football. WSU had a succession of well known coaches after Walden in Dennis Erickson, Mike Price, and Bill Doba and all had varying degrees of success. Erikson’s last of his two seasons resulted in an Aloha Bowl appearance before he jumped to the head job at The University Of Miami and he later became an NFL head coach before returning to the collegiate ranks. Price put the Cougars into the national consciousness with two Rose Bowl berths, in 1997 and 2002. Quarterbacks Mark Rypien, Drew Bledsoe, and Ryan Leaf all earned post season awards and NFL recognition. Despite the small school, rural setting of Pullman, the beautiful campus and promise of playing excellent football against top competition makes the Cougars an always dangerous opponent capable of upsetting any opponent.